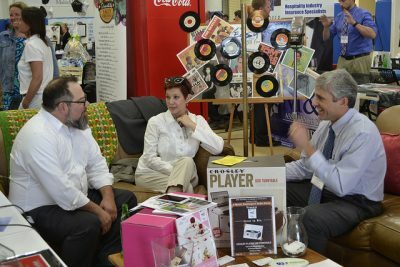 Mount Washington Radio Group Owner Greg Frizzell sits and chats with other business professionals in the Mount Washington Radio Lounge at Expo 17 ~ Photo Courtesy of Mount Washington Valley Chamber of Commerce. NORTH CONWAY, NH – The Mt Washington Valley Chamber of Commerce is poised to offer EXPO 18, with even more opportunities for collaboration, partnerships, and education on Tuesday, May 22 at the North Conway Community Center, from noon – 5:00pm. This one-day event is packed with networking and educational opportunities for businesses from large to small. Over 45 Companies from fields of information technology, energy, recreation, insurance, media, wellness suppliers and more will be on hand under one roof to showcase their products and services. EXPO 18 offers an opportunity to learn about new innovations, network with colleagues, launch potential partnerships and relationships between Valley businesses, plus learn from experts. All the EXPO 18 components are free and open to the public. Two workshops focused on solving labor issues for businesses throughout New Hampshire’s North Country will be presented at the North Conway Community Center, starting at 2:00pm. Our economic vitality is threatened daily with the exportation of skilled labor, the potential end of DACA, a ban on travel, visa approval or disapproval, the I-9 process, ICE and other unforeseen impacts. It is crucial that we take a long-term educated approach to filling our employee vacancies with a limited skilled and ready workforce. John R. Wilson, Esquire, President and Partner of Goff Wilson, P.A., a global immigration law firm from Concord and Paris, will share information and insights on the issues of keeping our global employee base through immigrant and nonimmigrant programs. Wilson is co-founder of the firm, and his practice focuses exclusively on global immigration. Mr. Wilson has consistently been selected as one of the ‘Best Lawyers in America’ under the ‘Immigration Law’ category published by the National Polling Firm of Woodward-White. The second part of this workshop will be a panel discussion sharing current labor trends in the valley and career opportunities that are available through apprenticeships, credentialing, certification and licensing. Bruce DeMay, Director of the Economic & Labor Market Information Bureau at the NH Dept. of Employment Security, sharing the latest state and local trends for the economic and labor market. Parker Haines of BD Painting and Property Management, a young professional proving the value of entrepreneurship in meeting his goal of staying and making a life in the valley and his desire to create opportunity for other young professionals. Christopher Nicolopoulos, Esq., Director of the New Hampshire Association of Insurance Agents, dispelling myths on finding professional career opportunities in the valley. Bailey Damon, Leadership 2018 and Thrive Program, sharing a unique program developed by the 2018 Leadership class to encourage young people’s desire to stay in the valley making a good living without incurring student debt. Seating is limited, and reservations are requested for both free workshops. Please contact Michelle Gittleson at 603-356-5701 ext. 300 or [email protected] to register. Northledge Technology offers comprehensive technology solutions for businesses and homeowners. At the Expo they will provide the latest in voiceover IP phone systems and communications technologies. These two organizations of young professionals will be sponsoring lunches and the snack bar to support their project Thrive MWV, a program allowing individuals to access and explore advanced career opportunities throughout the Mt. Washington Valley. Knockerball North Conway and Archery Tag staff, from the only turf facility in the Mt Washington Valley, will be on hand to demonstrate archery tag and provide information about their facility and how to plan an offsite event. More than 45 exhibitors have signed on to offer information, demonstrations and more at EXPO 18. There’s still room for additional exhibitors. Simply click here to access the online exhibitor registration form. EXPO 18 concludes with the Conway Daily Sun’s Best of Mt Washington Valley Awards winner announcements and social event at 5:00pm at the North Conway Country Club. Come congratulate winners of the “Best of the Valley” Awards along with the recipient of the Student Entrepreneur Award, which will be announce here too. EXPO 18 is presented by the Mt Washington Valley Chamber of Commerce. Premier sponsors include WMWV 93.5fm, Easy 95.3fm and Magic 104fm, and Eastern Propane and Oil. The Education Sponsors are SCORE and Chalmers Insurance Group, and Supporting Sponsors include Heartland Payment Systems, New Hampshire Electric Co-op, TD Bank, and Northledge Technologies. The lunch and snack bar are sponsored by Stay MWV and Leadership MWV. Media sponsors include Conway Daily Sun and Business NH.